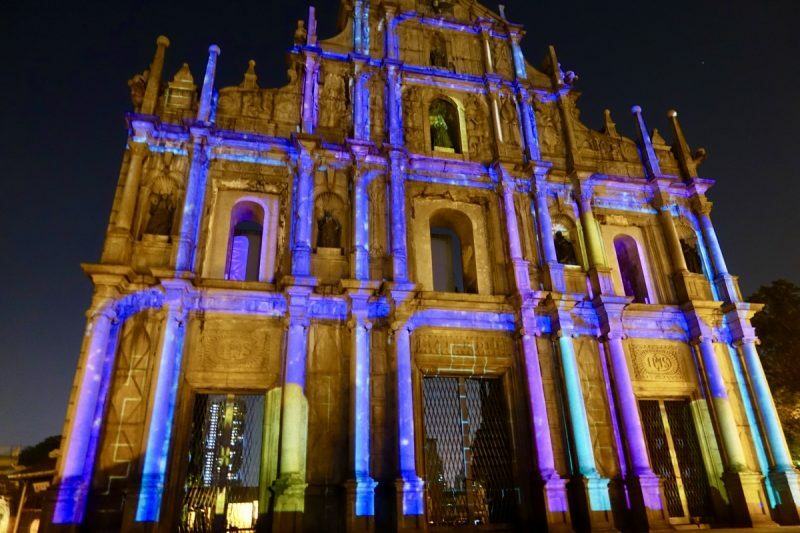 We hadn’t been to Macau before, and once I had added Hong Kong to the itinerary, it was a no-brainer to also pop over to Macau for a couple of nights. 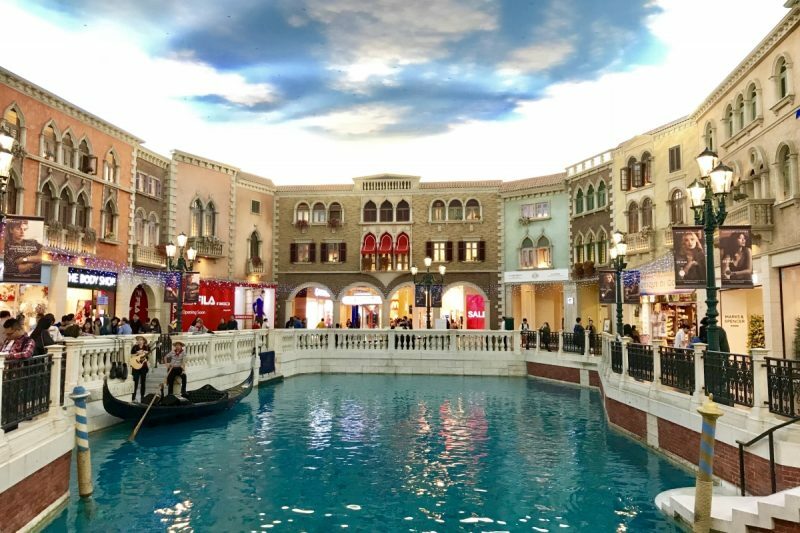 I hadn’t really had much interest in Macau previously, but we were so close, had a day or two free, so here was an opportunity to see if reality matched my preconceived ideas! The most common way to get to Macau is by a one hour ferry ride from Hong Kong. Ferries run every 10-15 minutes, so I assumed there would be no problems just turning up and getting on a ferry! What I didn’t anticipate was the demand. Not sure if it was because it was the day after Christmas, but on our arrival at the ticket office at the ferry terminal, the signs announced the next available ferry was at 2:15pm. It was currently just after 10am. Simon lined up to get the tickets, and we were lucky that when he got to the window someone had just cancelled two tickets on the 12:30 ferry, so we were able to grab those! Macau has much in common with Hong Kong. Until 1999 it was considered to be part of Portugal. 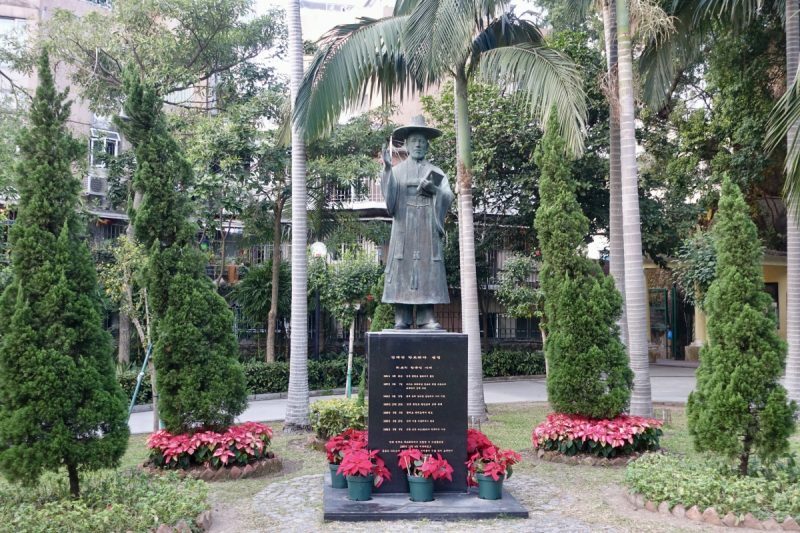 It was handed back to China and is now a Special Administrative Region (SAR), just like Hong Kong. Similarly Macau is also made up of two main parts, the Macau Peninsular attached to mainland China, and the Cotai area, islands now connected to the peninsular by bridges. 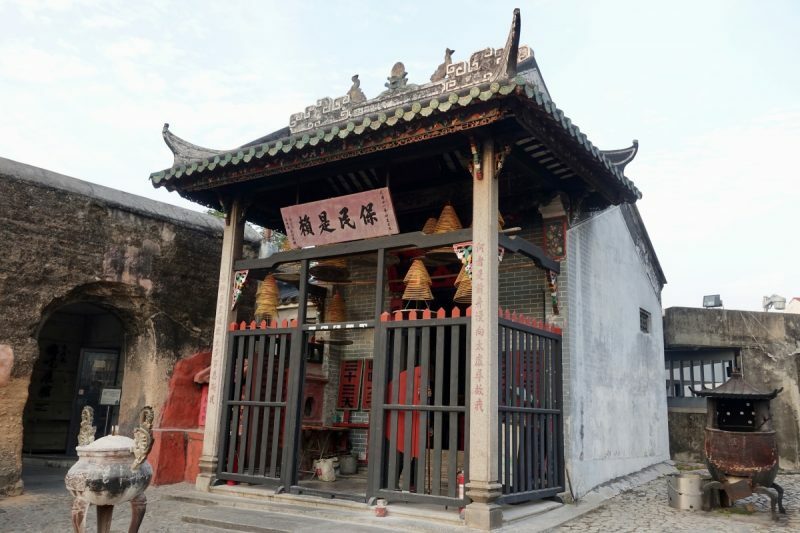 We stayed in the older section on the Macau Peninsular, and it is in this area that the Portugese influence is most obvious. 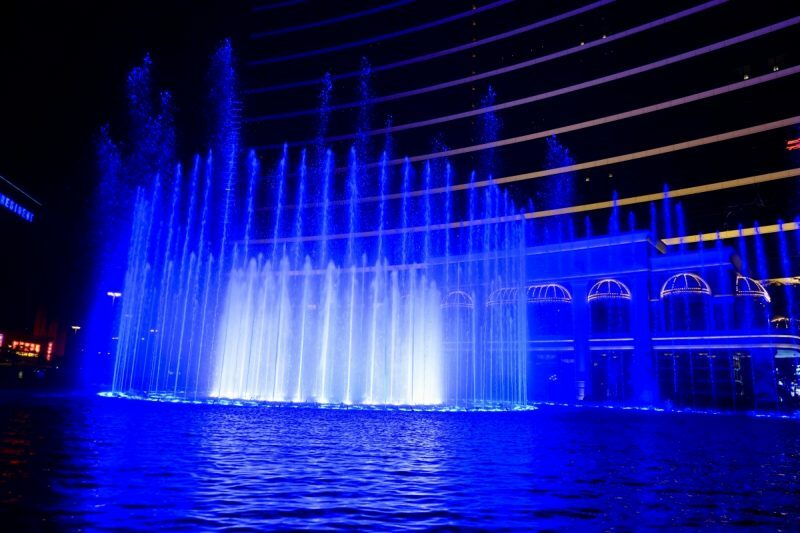 The Cotai area is the home of the newest, biggest, and most over the top casinos and resorts – but more on that later! Once we checked in to our hotel, we still had a few hours of daylight to get out and explore this part of the city. We made our way towards Senado Square. 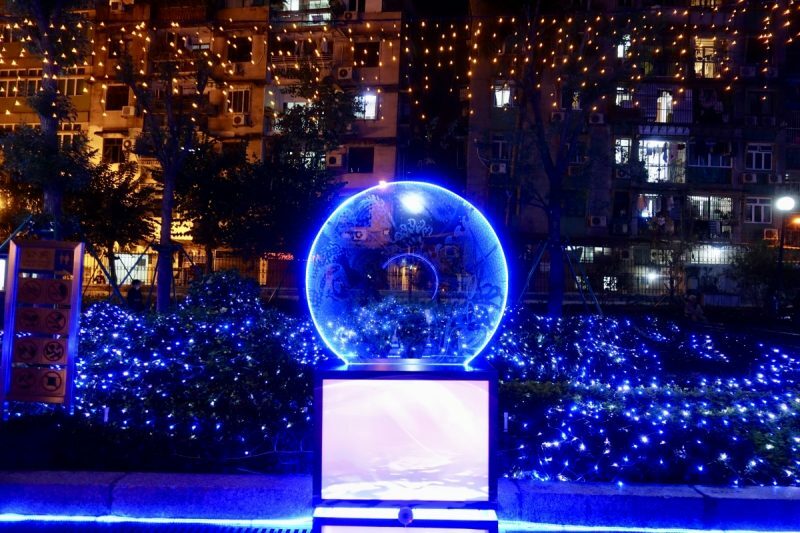 As it was the day after Christmas, the streets were still filled with lights, decorations and displays. 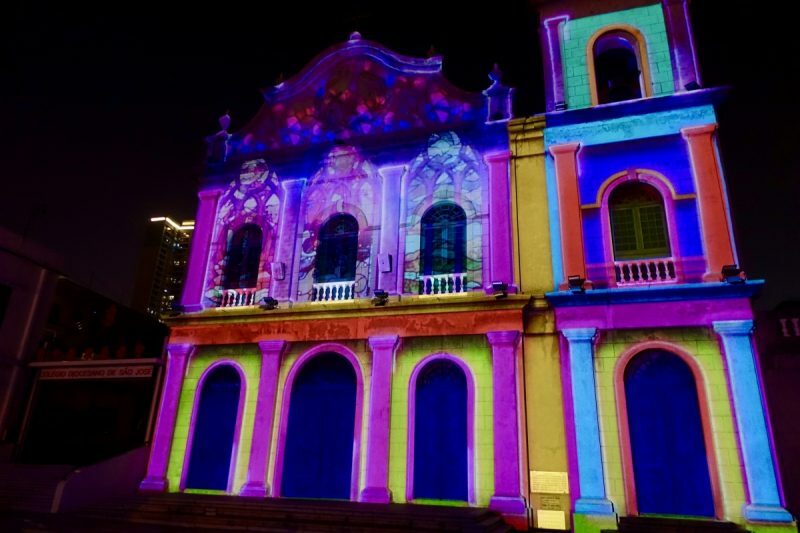 I had also read that during the month of December Macau has a Light Festival that has displays in various areas around the city, and I was looking forward to that once the sun went down. 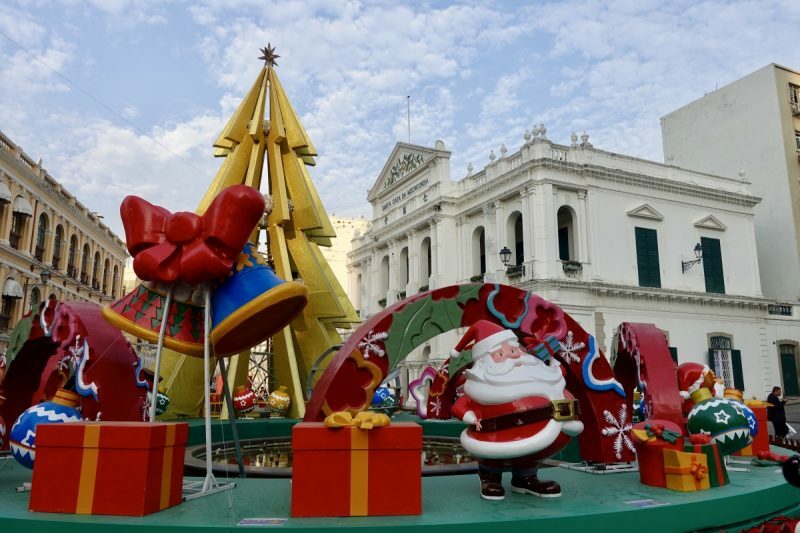 Christmas display in Senado Square surrounded by classic European buildings. From Senado Square we followed the crowds along the pedestrian streets. Both sides of the streets were vendors giving out samples of different foods. For some reason the most popular here was different types of flavoured and dried meat, not unlike jerky or biltong. It was all delicious, and with a new shop giving out samples every. few steps, we got quite a decent snack as we walked along! The didn’t stop us also buying Portugese Egg Tarts as we made our way to the ruins of St Paul’s. 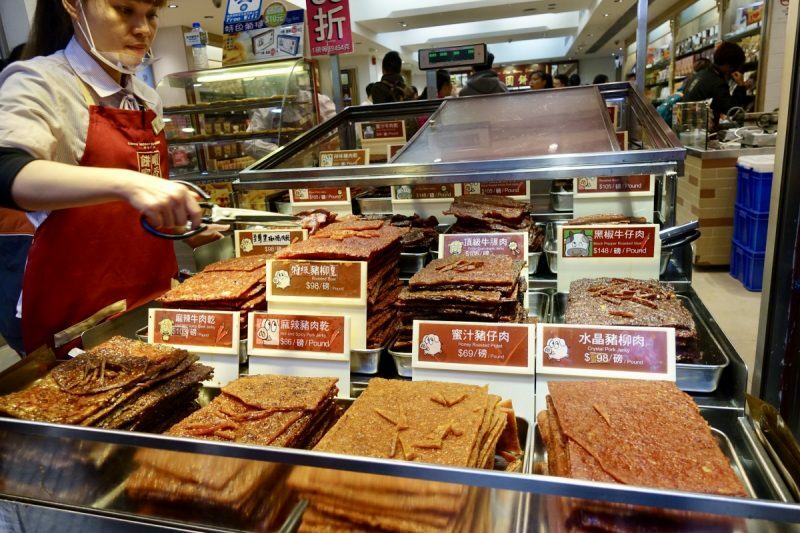 Slabs of dried meat that made for a tasty little snack. 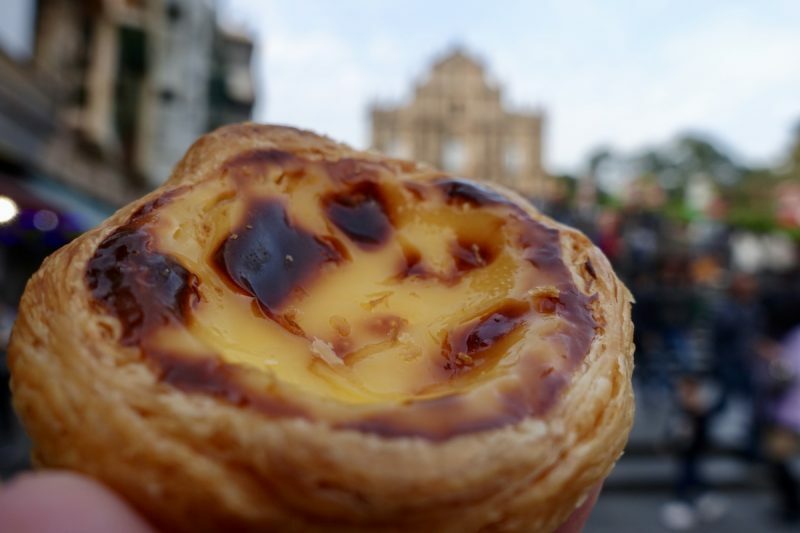 A Portugese egg tart – delicious! 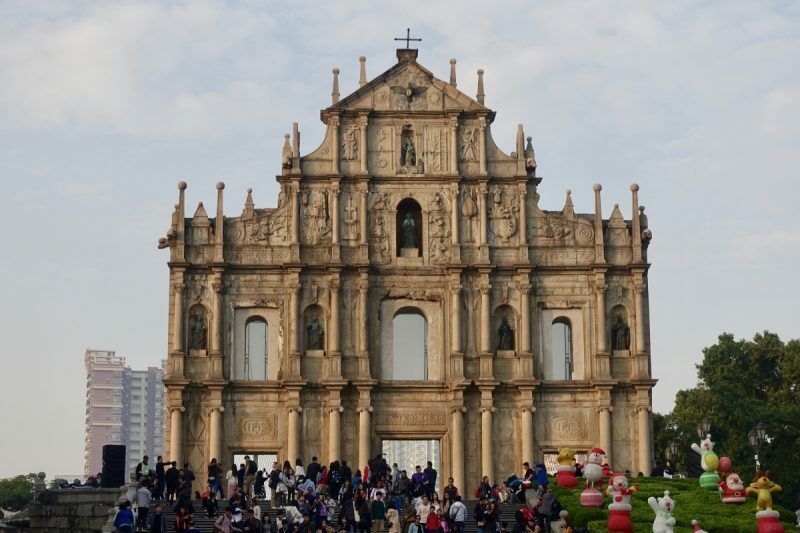 The Ruins of St Paul’s are probably the most iconic historical site in Macau. These UNESCO listed ruins were formerly a church built back in the 17th Century. It was burnt down in the 1800s during a typhoon, and pretty much only the facade of it now remains. We walked up to the left of the ruins, and made our way past this cute little temple before coming to Camoes Garden. The garden itself was not much, but we enjoyed watching the local people out getting their evening’s exercise and groups enjoying card and dice games. 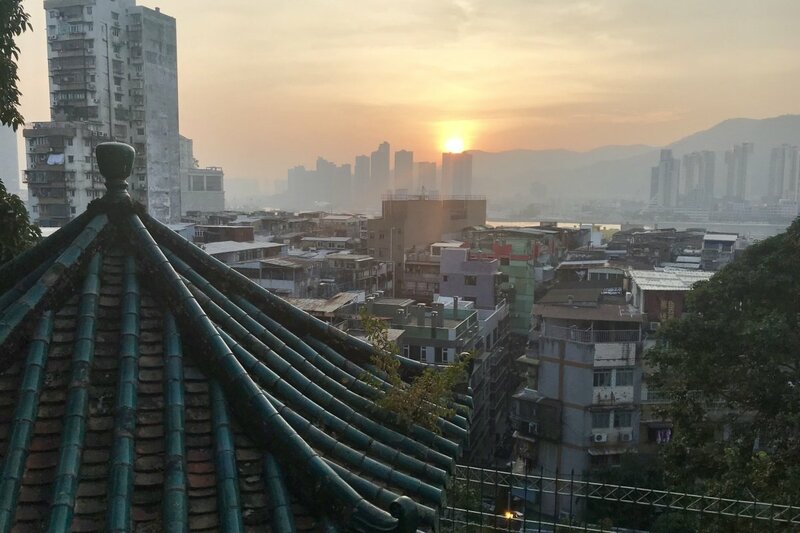 We came to a high place in the gardens just as the sun has disappearing bhind the hills in the background so got to watch the colours of the sunset over the rooftops of Macau. We continued on towards the area containing St Lazarus Church. We knew that one of the Light Festival displays was here, but we still needed to waste a bit more time before it started. 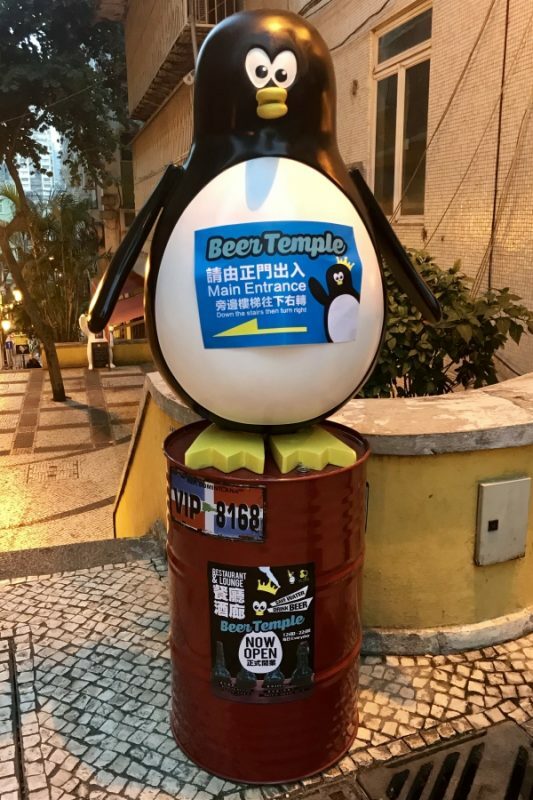 Luckily we stumbled across huge penguin, advertising a craft beer shop called Beer Temple. I don’t drink beer, but Simon got to taste one of the local brews. 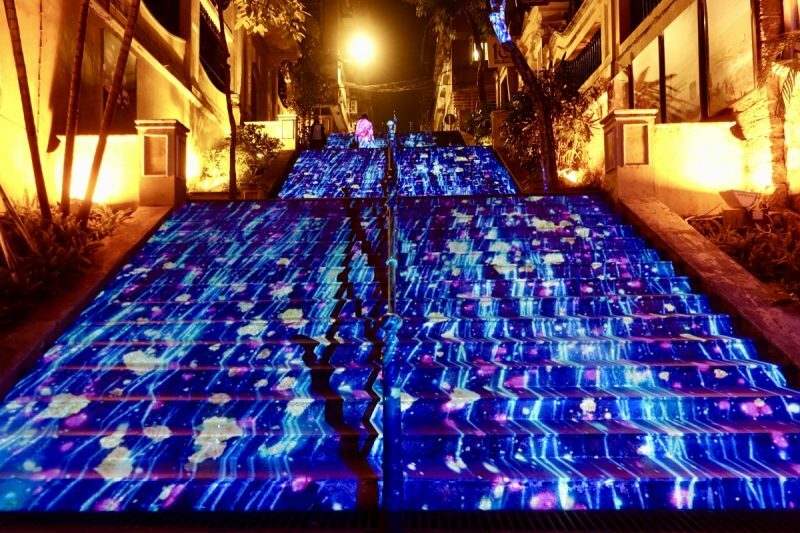 One of the cobbled streets in the the od part of town as the lights started to come on. 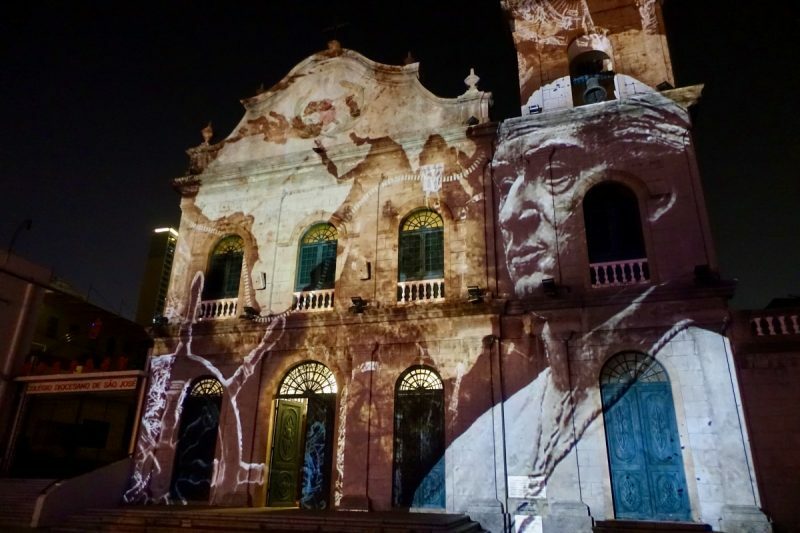 We left in time to see the light show start, first on the steps on Calcada da Igreja de São Lazaro, then we saw the ten minute light and music show as images were projected onto St Lazarus Church. 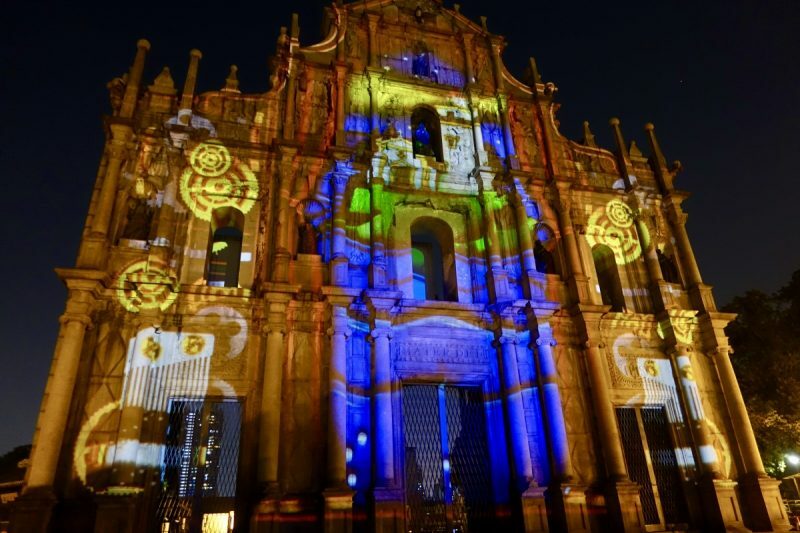 We retraced our steps back through the now lit up Camoes Garden, arriving back at the Ruins of St Paul’s in time to see the light show there. While there was a much larger crowd here and the show was a bit more dramatic, we actually liked the one at St Lazarus better. Each of these shows (and at other venues through the city) were repeated every thirty minutes during the evening. The Ruins of St Paul’s looking like it has a plumbing pipe scaffold. By now we were getting hungry, and even another trip through the streets with the samples did not do the trip so we went in search of somewhere to eat! 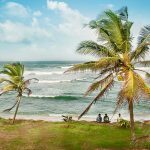 We clearly walked down all the wrong streets, becasue we could hardly find anywhere with food, and when we did it was high end restaurants – and we just weren’t dressed for those! We even came across another couple searching for food as well! We were making our way back to our hotel and eventually found a food court on the top. floor of a deparment store which looked reasonable, but there was not one bit of English anywhere! I’m sure this meant the food was fatastic local fare, but it didn’t help if we had no way to order it. 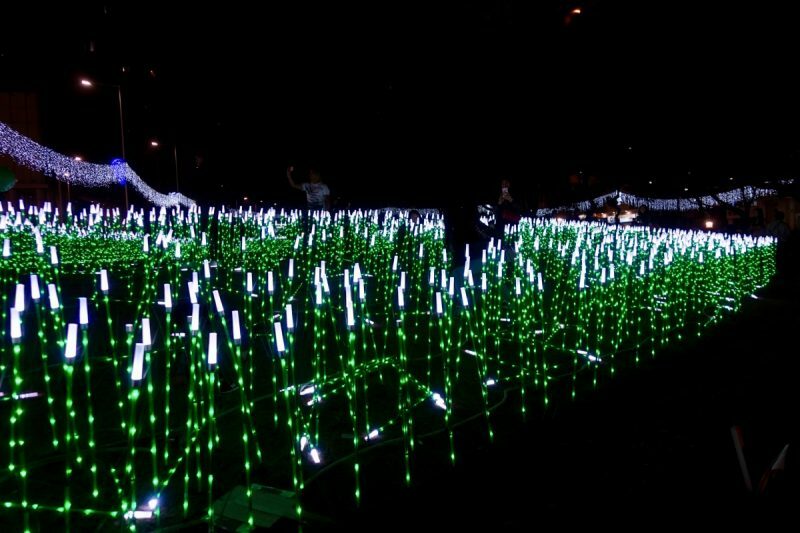 After about an hour of searching we had almost given up when I took another detour through a light display that was like a field of little Christmas trees. It looked fantastic, and there were people all through it taking photographs. I hope their photos worked out better than mine did! The field of Christmas trees – that dark patch is Simon in the trees! The lights were cool, but there, in the distance, was another light that drew us in – a huge yellow “M”. Yes, the Golden Arches of McDonalds saved us. I was so tired by this point I just told Simon to get me whatever, so a random burger and fries later (they were different to those we have in Australia and again not in English) I was feeling slightly better, but only had enough energy to get back to our hotel and crawl into bed. Day two of our Macau visit was gong to be dedicated to checking out the casinos. Let me start by saying I am not a gambler. At all! I have probably been to a casino once in the last ten years (we missed a train by minutes in Adelaide and the casino is right next door so went in there to occupy the hour before the next train!) and really I had no interest in gambling now. But since Macau is all about the casinos, we had to at least have a look. 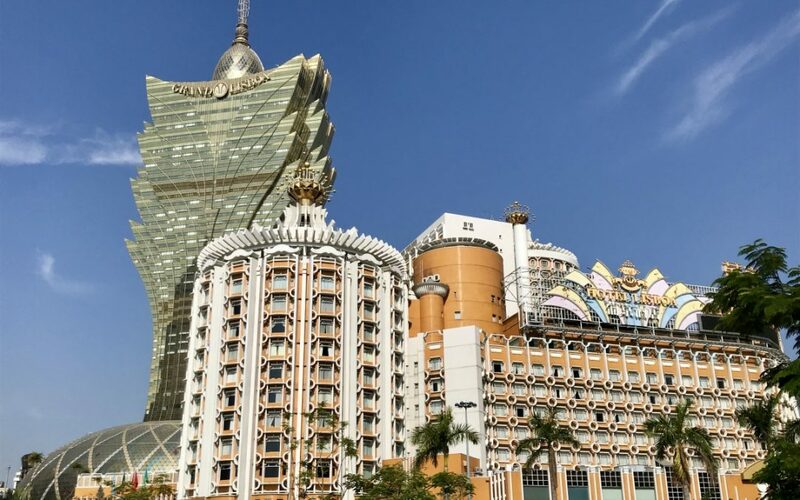 At last count Macau has over 50 casinos. It also only has a population of around 650 000. I think a very big proportion of that population must work in these huge gambling dens. They are caverous once you get inside, with tables as far as the eye can see over multiple floors. The excess here is actually obscene. I have often heard that people find the display of wealth in Dubai insane. 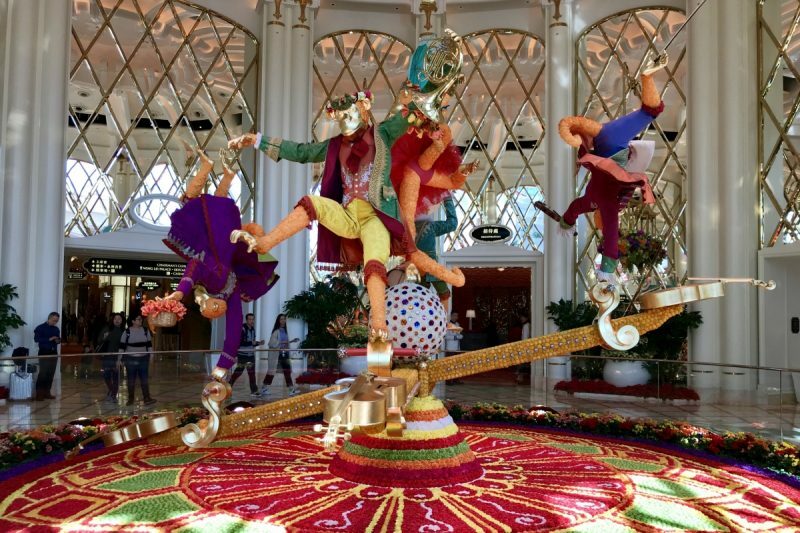 These casinos are, well, next level! 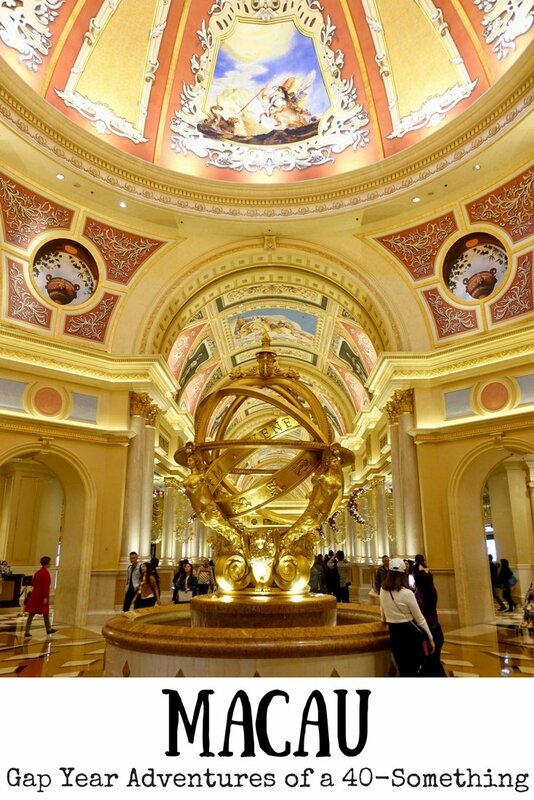 Attached to the casinos are huge – and I mean massive, some have well over a thousand rooms – hotels and shopping malls. It’s probably very much like Las Vegas but I haven’t been there so can’t truely compare. Here the clientele are mostly visitors from China. 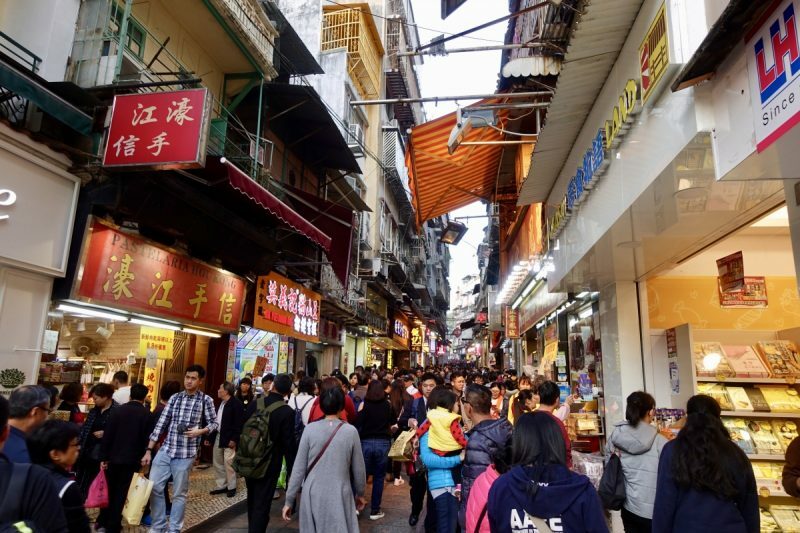 There are also a huge number of people who come to Macau just for a day trip from Hong Kong. During our visit we saw only a handful of western tourists. We first visited some of the casinos of the Macau Peninsular side of the city. 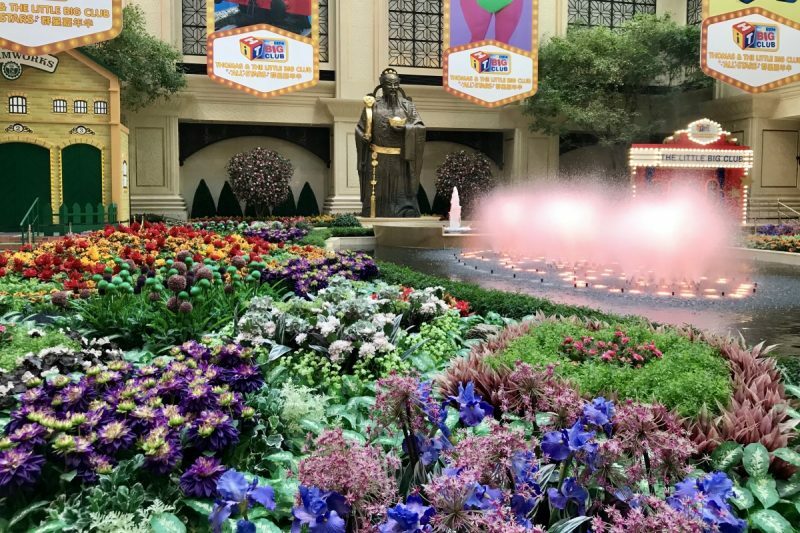 A hot tip to get over to the Cotai side – find a casino that has a sister site over the water, and use their free shuttle bus to take you there. We were wandering through the Wynn Casino and saw a sign for the shuttle to Wynn Palace so thought we would give it a shot. I had read that the casinos had started to make sure you were legitimately staying with them or had been a customer in their casino, but we were not even asked for proof. If I thought the casinos on the Macau side were fancy, they were nothing compared to the big, new “mini-cities” on the Cotai side. On arrival at the Wynn Palace we couldn’t help but notice it offered transfers from the road to the hotel by – of all things – cable cars! All free. A gimmick to entice you to go into their casino to spend your hard earned cash. 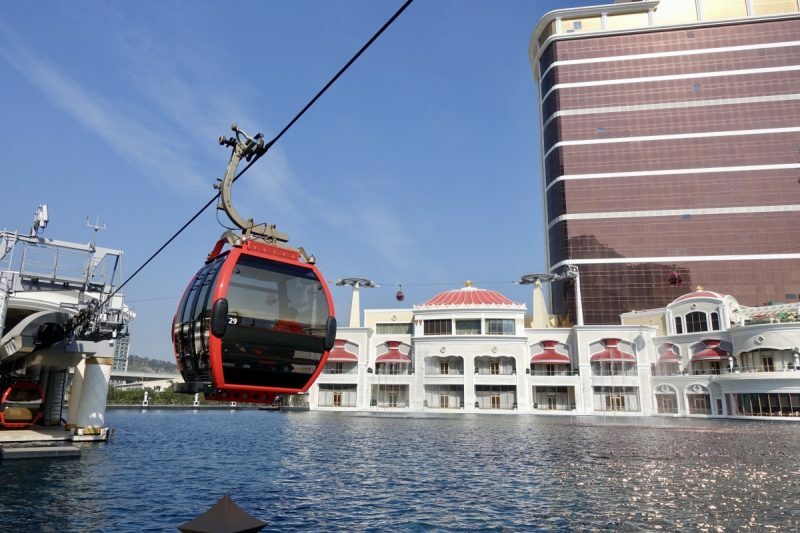 A cable car ride to get into the casino – that’s a new level of over the top. We spent a few hours wandering around them all – The Ventetian, The Parisien, The Sands, the City of Dreams. They were all shiny and gold and big! In my mind now they are all merged and apart from distintive features like The Venetian’s canal I couldn’t tell you one from another. We couldn’t take photos inside the casinos, so I don’t even have those to prompt my memory. The canal inside The Venetian, complete with gondolas. Sometime during the afternoon we stopped for a late lunch at the Hard Rock Cafe to tick that one off Simon’s list and rest my feet. 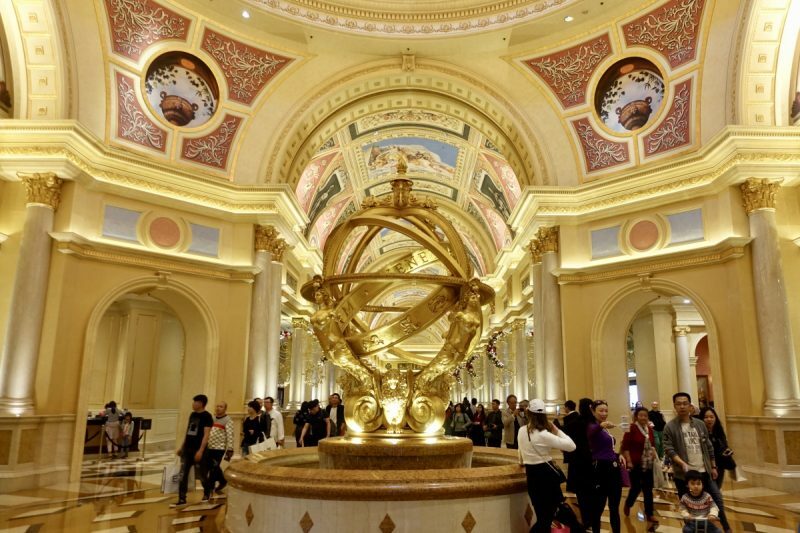 We then finally took advantage of that cable car and rode it back into Wynn Palace, where we walked around in cricles for a while trying to find the right exit for the shuttle bus back to the other Wynn. Back on the right side of the water, we joined the crowds in front of the Wynn to watch the musical fountain show put on every half an hour. I think it happens during the day too, but the lights at night make it so much more impressive. While it doesn’t come close to the big shows (like the one in front of the Burj Khalifa in Dubai) if you are in the area, it’s a nice bit of entertainment for a few minutes. There were some flames shot into the air right near the end too. It was as I was doing some checking before I went to bed that night that our next 36 hours were thrown into turmoil. 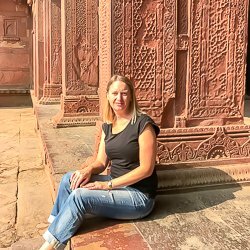 Our plan was to catch the ferry back to Hong Kong then get the train to the border of Mainland China, and spend a couple of days in the Shenzhen area with a special 72 hour visa on arrival. I was reading about the process and came across a note saying that it was likely that if a visitor had a Turkish (plus two other countries I can’t remember) stamp in their passport, they would be denied the VOA. Oh no! I went to sleep that night thinking we would just give it a go and see how it went. I did some more reading in the morning and found more people that had been denied so we changed our minds and decided not to go to the border. We seemed to have a high chance of being refused, so didn’t want to waste the time or pay the fee knowing we probably wouldn’t get in. 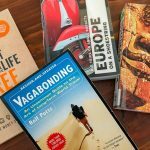 Luckily the accomodation we had booked was fully cancellable and we had not yet booked our flights out as I was a little worried about the visa. But what were we going to do? We realised at this point we didn’t even know what country we would be sleeping in that night. Remember it is between Christmas and New Year, a really busy time for travel, so everything was expensive! Flights were insane, and accomodation even worse. 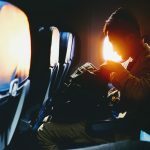 I searched for flights into every country in the area we could get into without a visa. We also had luckily applied for our Cambodian e-visa a few days before and that came through while I was searching. I found a decently priced flight direct to Phnom Penh for 7pm, but I was having all sorts of trouble trying to book it online. We were nearing checkout time for our hotel, so decided to make our way to the Hong Kong airport and try again there. If I couldn’t book onlne, surely there was someone there who could sell us the flight. The ferry trip back to Hong Kong was just torture. It was a little bit wavy, and all of a sudden half of the passengers were making good use of the sick bags supplied. I don’t get any kind of motion sickness, but I do have a very weak stomach when it comes to smells and retching sounds, and omg, this trip really tested me! Not only could I hear and smell what was going on, our allocated seats were in the back row. Right behind us was the bin everyone was using. I could not get off that boat quickly enough! Once at the airport there was still no luck buying the flight on the internet, so we tried to find someone who could sell it to us. But there wasn’t anyone. The company who did checkin was only contracted to do that, not sell tickets, and I couldn’t find a travel agent who could help. So we gave up on that flight. Our next option was also to Phnom Penh, but it was about $100AUD each more expensive, and it was via Kuala Lumpur, with a four hour transit between 3:30am and 7:30am. The two flights were only an hour or two each, so no time for any decent sleep. The stuff of nightmares, but at least it didn’t mean a night in Hong Kong airport and beginning the process again the next day! Oh the joys of travel! 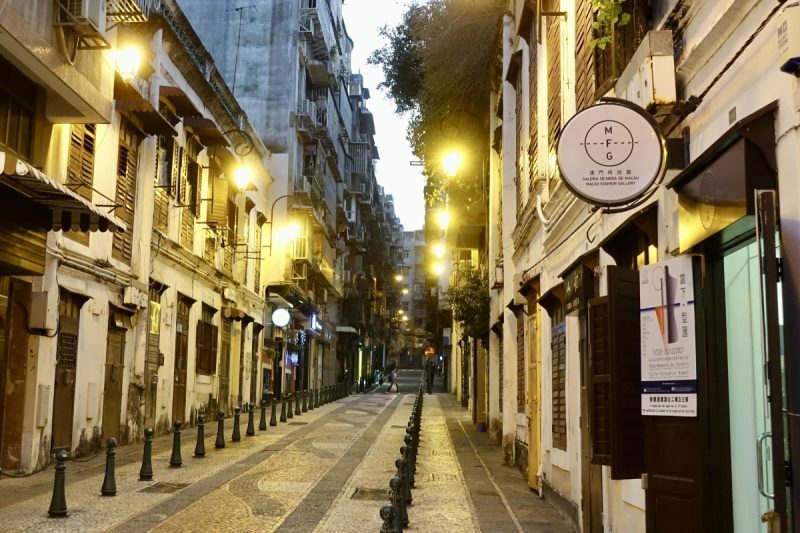 I enjoyed the evening spent in the old part of Macau, but the casinos were really not my thing. Oh, they are flashy, and I’m glad I’ve been to have a look, but I don’t feel any need to go back for more. It would have been nice to go to the show at The House of Dancing Water, but we couldn’t get tickets at the last minute. I’m not sure if it’s always booked out, our it was just the time of the year. Wifi was available in the ferry terminal, and in every casino, hotel and shopping mall. It was easy to survive here without data. Transport is hard for me to comment on. The ferry from Hong Kong was easy to find and use, but busy. Again, it could have just been the time of year. Apart from that, we didn’t use any of the local transport, only the casino shuttle bus. Macau is not a cheap place to visit. It is aimed at the well heeled traveller. 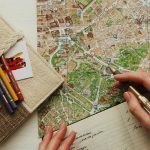 While it is possible to find cheaper options, they are not plentiful and this is not the place to come on a very tight budget. Our hotel below was the cheapest we could find, and many more were significantly more expensive. 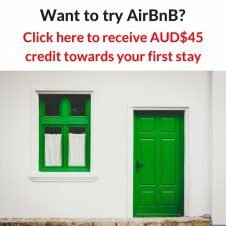 Is Marina Bay Sands Worth It? You are probably thinking more of the new part, which is very modern with lots of big hotels and buildings. I didn’t get too many photos of that part. Thanks Zeba. Yes, we have been to many countries with no McDonlads, and it is a familiar, comforting sign when we see it.